Holding signs with the now-ubiquitous “MuteRKelly” hashtag, advocates gathered outside Sony’s Manhattan headquarters Wednesday to demand subsidiary RCA drop the singer. 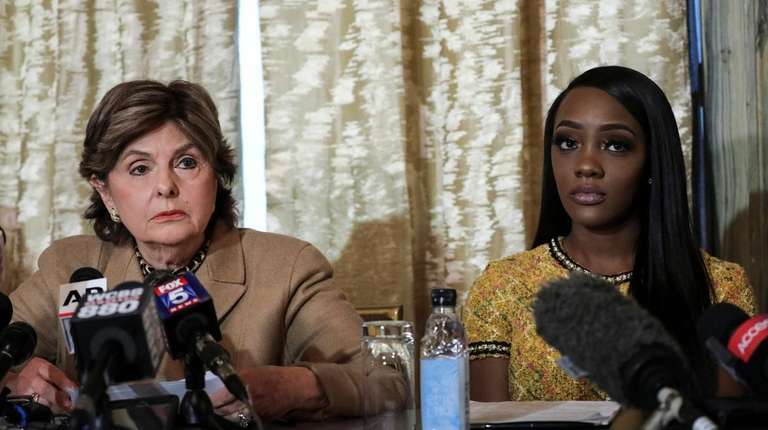 After decades of alleging sexual abuse, R. Kelly's accusers have a renewed voice from Lifetime's "Surviving R. Kelly" docu-series, which premiered on Jan. 3. “New Yorkers definitely showed out today and showed they are not only interested in holding R. Kelly accountable, but also holding RCA accountable as a corporate enabler,” said Jade Magnus, the director of organizing for racial justice group Color of Change. Magnus joined representatives from Girls for Gender Equity and other groups to hand deliver the petition to RCA during the protest. A security worker met the women at the door to accept the paperwork on behalf of RCA. A handmade golden “Record Label of Shame” award, aimed to resemble a Grammy, was also presented to the label by the group. "We called yesterday and let them know we'd be there, so he was waiting for us," Magnus said, adding that the group first tried to contact RSA with concerns in 2017. "They essentially put us in a holding pattern and basically stopped replying after a while," she added. "We had one or two conversations. They didn't take us seriously." After receiving a boost in signatures following the six-part “Surviving R. Kelly," Magnus joined forces with groups with similar goals to draw attention to the label's "funding of his sexual predation of young black girls" by way of the protest. The doc includes interviews with several women detailing, on-camera, allegations of sexual, mental and physical abuse by Kelly spanning decades. A criminal investigation examining the allegations has reportedly been opened in Georgia. In Illinois, Cook County State's Attorney Kim Foxx has publicly asked for victims to speak up. Joanne Smith, the founder of Brooklyn-based Girls for Gender Equity, said that everyone who witnessed Kelly's alleged abuse and turned a blind eye is complicit. Sonja Spoo, associate campaign director with Ultraviolet, said the protesters "were not letting (RCA) be silent. We see you, we see what you've been doing ... and we're not here for it anymore. "We're done with the continued abuse of black women and girls." A number of celebrities denounced R. Kelly following the release of the Lifetime doc, including Lady Gaga, who released a statement apologizing for her 2013 track “Do What U Want (With My Body),” which featured the artist. Chance the Rapper, Lady Gaga and others have since pulled tracks featuring R. Kelly collaborations from streaming services. Reports of sexual abuse involving R. Kelly surfaced nearly two decades ago after the Chicago Sun-Times received an anonymous video recording of the artist involved in a sexual act with an apparent minor. Reporter Jim DeRogatis followed the investigation for the publication. A 2017 Buzzfeed report sparked the #MuteRKelly movement, backed by Time’s Up. The report claimed the artist was keeping young women under his control in a cult-like environment. "We believe survivors and we believe black girls and women," Magnus said. "There's a system that has enabled this to happen and we do intend to continue to target all of them."